Several eyewitnesses reported heavy damage and bodies in the streets of the capital, Port-au-Prince, where concrete-block homes line steep hillsides. There was no estimate of the dead and wounded Tuesday evening, but the U.S. State Department has been told to expect “serious loss of life,” department spokesman P.J. Crowley told reporters in Washington. “The only thing I can do now is pray and hope for the best,” the ambassador, Raymond Alcide Joseph, told CNN. 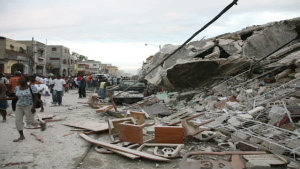 Pictures sent to CNN’s iReport show homes and small businesses inHaiti that have collapsed. Text message: Text the word “HAITI” to 90999, and a $10 donation will be given to the Red Cross. The $10 donation will appear on your next mobile bill. Wyclef Jean’s foundation, Yele Haiti. Text message: Text “Yele” to 501501 and $5 will be charged to your phone bill and go toward Hatian relief projects.